A broken heel or fractured calcaneus bone is usually caused by falling or jumping from a height, resulting in severe heel pain. It can also occur from road accidents or bike accidents. 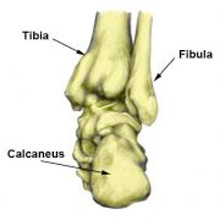 It is also possible for the calcaneus or heel bone to suffer a stress fracture in athletes, such as long-distance runners, which may come on more gradually. There will usually be a sudden pain in the heel at the time of injury with rapid swelling and bruising developing shortly after. With an acute calcaneal fracture, the athlete will have difficulty putting weight on the foot. A calcaneal stress fracture will have symptoms of heel pain, but it will have come on gradually where the patient cannot pinpoint a specific event that caused the injury. Seek medical attention immediately if you suspect a broken bone. Treatment usually involves immobilizing the foot in a plaster cast for 6 to 8 weeks while it heals. This will prevent the bone from bearing weight. Surgery is sometimes necessary, for example, if the fractured bone parts are out of position or displaced, or if the fracture has broken the skin. A surgical procedure can involve attaching a metal plate to the heel bones to return them to their normal position. At the same time, it is important to ensure that the cartilage is replaced as close as possible to its original position. Very occasionally, a fracture will not require a plate. A doctor can explain your best option for you. After surgery, the patient may be required to rest their foot from supporting weight for a recovery period that can last up to 3 months.